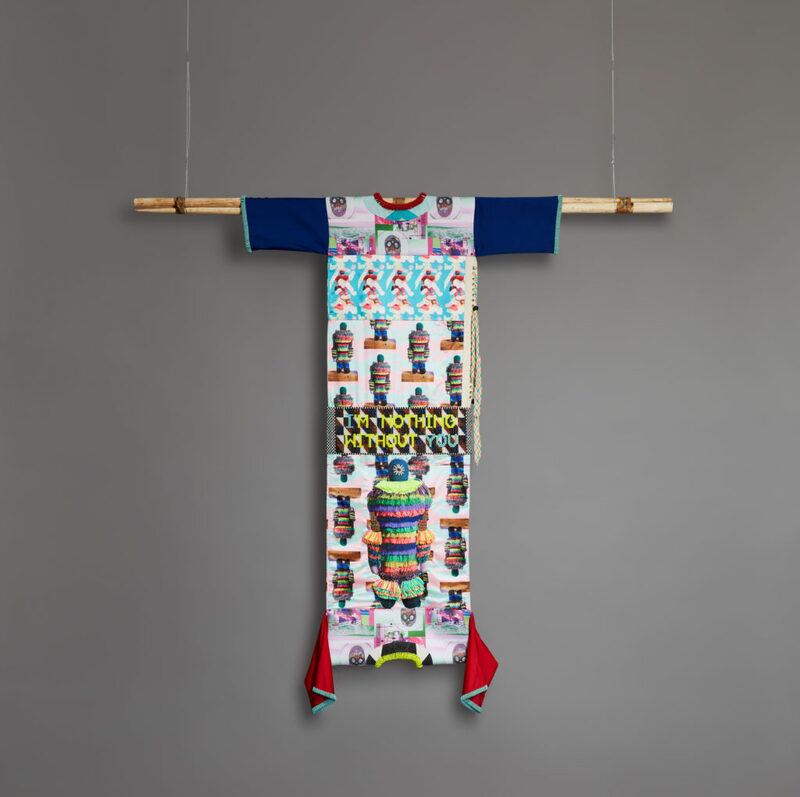 Jeffrey Gibson: This Is the Day highlights new developments in the artist’s genre-bridging practice. 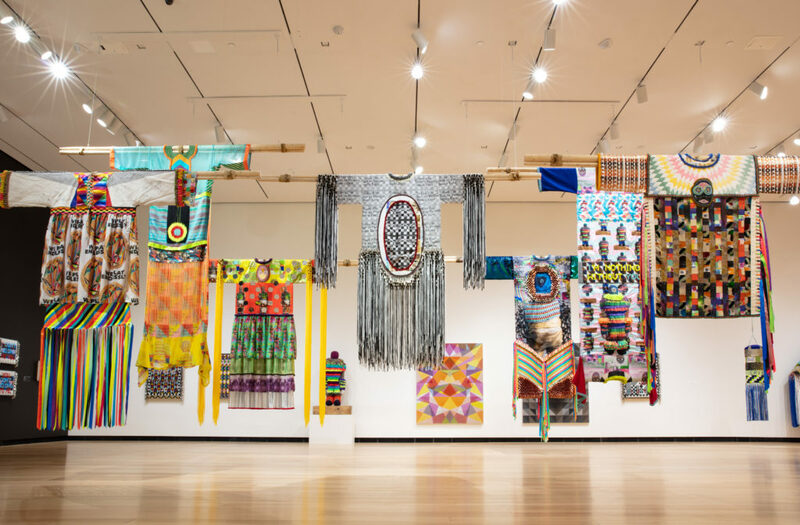 The exhibition features over fifty works made between 2014 and 2018 including intricately beaded wall hangings and punching bags, paintings, ceramics, garments, helmets, and a new video commissioned for the exhibition, I Was Here (2018). The film follows Macy, a trans-Choctaw woman living on a reservation in rural Mississippi, melding documentary and fantastical elements in a way that harkens back to independent films from the 1980s and 90s such as “Bagdad Cafe” (1987) and “My Own Private Idaho” (1991). In his work, Gibson (b. 1972; based in Germantown, New York) brings together his Choctaw and Cherokee heritage and a range of diverse artistic and cultural influences to explore race, sexuality, religion, and gender. 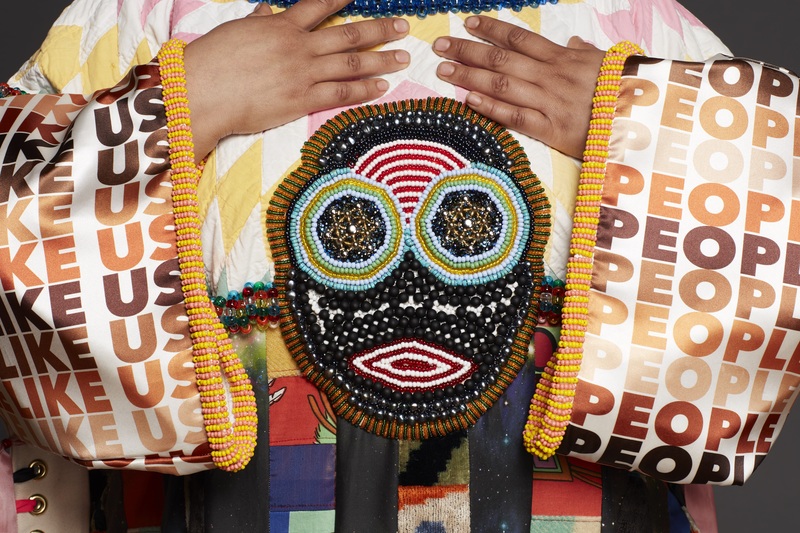 Gibson’s art often joins exuberant colors, patterns, and materials with text borrowed from such authors as James Baldwin and Simone de Beauvoir or song lyrics by Grace Jones, Boy George, and other musicians. 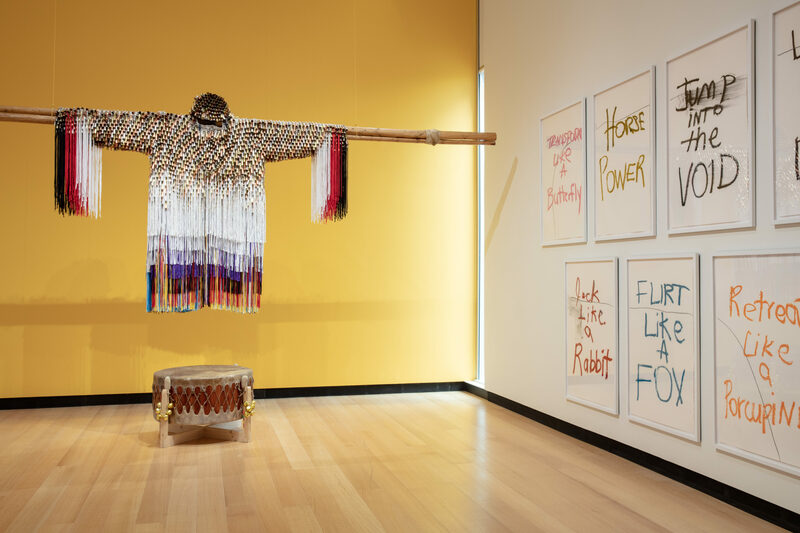 These combinations highlight the unexpected connections between ceremonies and performances found in Native American powwow rituals, dance clubs, and drag shows, underscoring the complex vitality of Gibson’s eclectic sources. 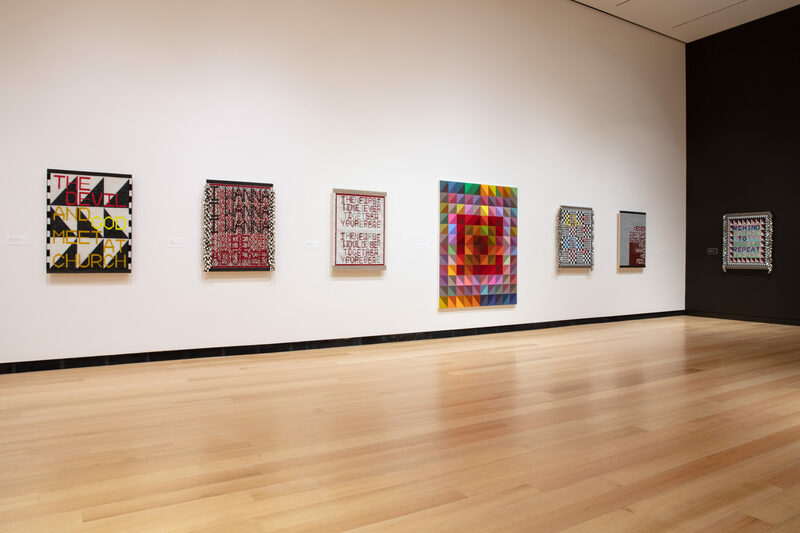 This Is the Day is organized by the Ruth and Elmer Wellin Museum of Art at Hamilton College in Clinton, New York. 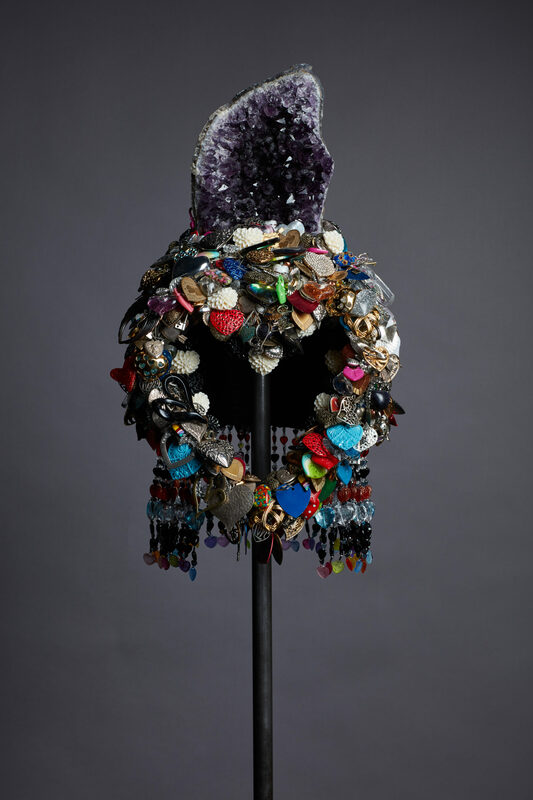 Jeffrey Gibson. “PEOPLE LIKE US,” 2018. Custom-printed polyester satin and neoprene, cotton, silk Ikat velvet, wool, repurposed quilt, tapestry, and vestment, with glass, plastic, and stone beads, nickel and brass studs, brass grommets, cultured pearls, nylon ribbon, and artificial sinew on canvas, suspended from tipi poles with rawhide ties, 85 x 74 x 5 in. (215.9 x 188 x 12.7 cm). Courtesy of the artist; Roberts Projects, Los Angeles; Sikkema Jenkins & Co., New York; and Kavi Gupta, Chicago. © Jeffrey Gibson. Photograph by Caitlin Mitchell. 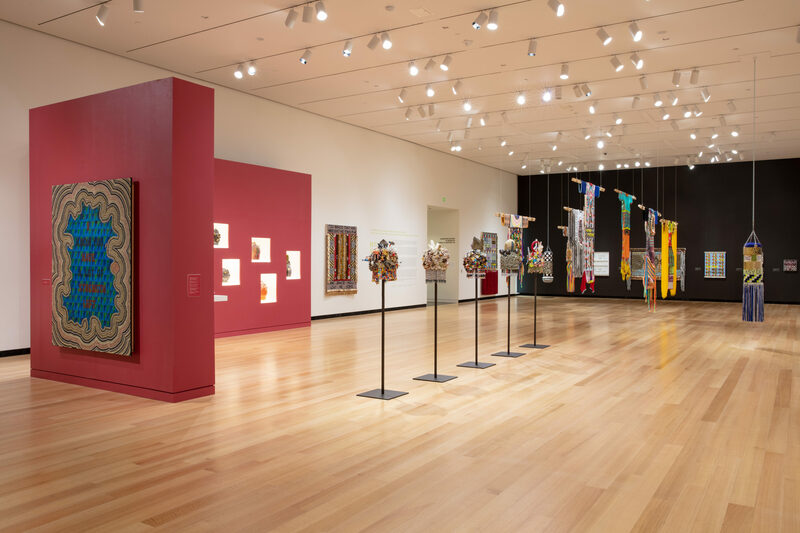 Exhibition installation view of “Jeffrey Gibson: This Is the Day.” Image courtesy of the Ruth and Elmer Wellin Museum of Art at Hamilton College, Clinton, NY. Photograph by John Bentham. 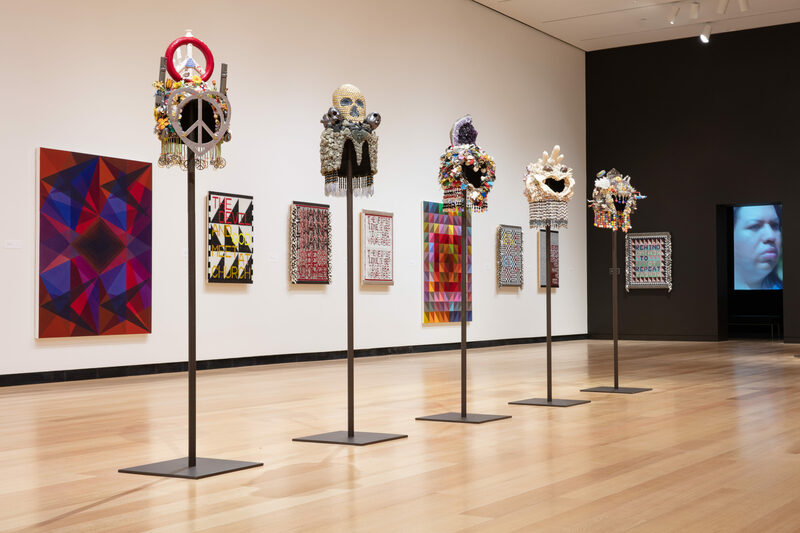 Join us for this special public program in conjunction with our exhibition Jeffrey Gibson: This Is The Day. The artist Jeffrey Gibson will be joined by Tracy L. Adler, Johnson-Pote Director of the Ruth and Elmer Wellin Museum of Art at Hamilton College, and Veronica Roberts, Curator of Modern and Contemporary Art, Blanton Museum of Art. This event will take place in our auditorium, located in our Smith Building. We’re marking the opening of Jeffrey Gibson: This is Is the Day with a celebration of your individuality, creativity, and authenticity. Join our B scene: A Love Supreme dance party where everyone will be encouraged to be their most genuine selves. You do you, and we’ll set the scene with classic 80’s tracks, food, art-making activities, and a private, members-only lounge to enjoy. Jeffrey Gibson: This Is the Day is organized by the Ruth and Elmer Wellin Museum of Art at Hamilton College, Clinton, New York. 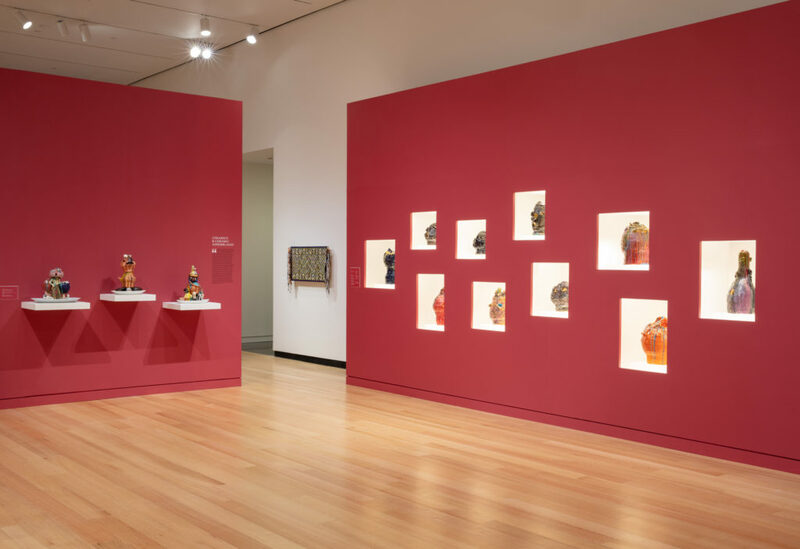 Generous funding for this exhibition at the Blanton is provided by Jeanne and Michael Klein, with additional support from Suzanne Deal Booth and Bridget and Patrick Wade. Jeffrey Gibson. PEOPLE LIKE US, 2018. 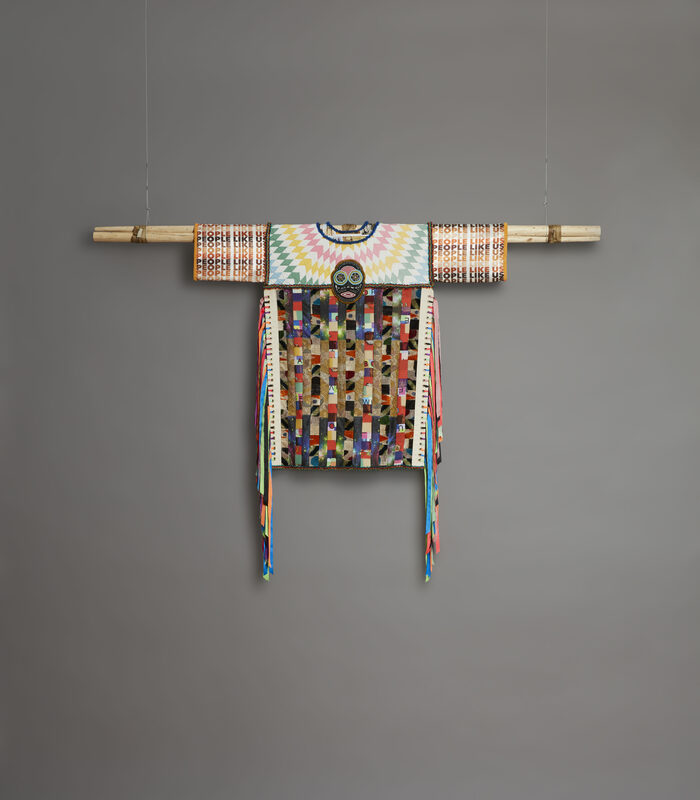 Custom-printed polyester satin and neoprene, cotton, silk Ikat velvet, wool, repurposed quilt, tapestry, and vestment, with glass, plastic, and stone beads, nickel and brass studs, brass grommets, cultured pearls, nylon ribbon, and artificial sinew on canvas, suspended from tipi poles with rawhide ties, 85 x 74 x 5 in. (215.9 x 188 x 12.7 cm). 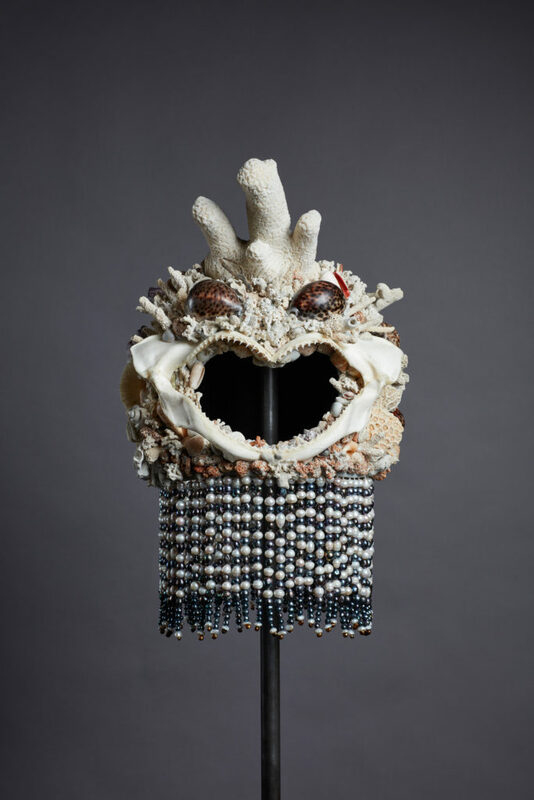 Courtesy of the artist; Roberts Projects, Los Angeles; Sikkema Jenkins & Co., New York; and Kavi Gupta, Chicago. Photograph by Caitlin Mitchell. Image courtesy of the Ruth and Elmer Wellin Museum of Art at Hamilton College.